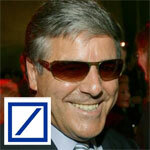 The boss of the mighty Deutsche Bank Josef Ackermann is laughing that Downing Street and the Elysee Palace are shooting their financial centres in the foot. He is acclaiming that Germany has a “comparative advantage” over other financial cities due to the fact that Britain and subsequently France will be taxing bonuses at penal rates. “To strengthen the financial hub of Germany I think is a very wise move” he sarcastically mocks with that crazy German sense of humour for which they are famous.